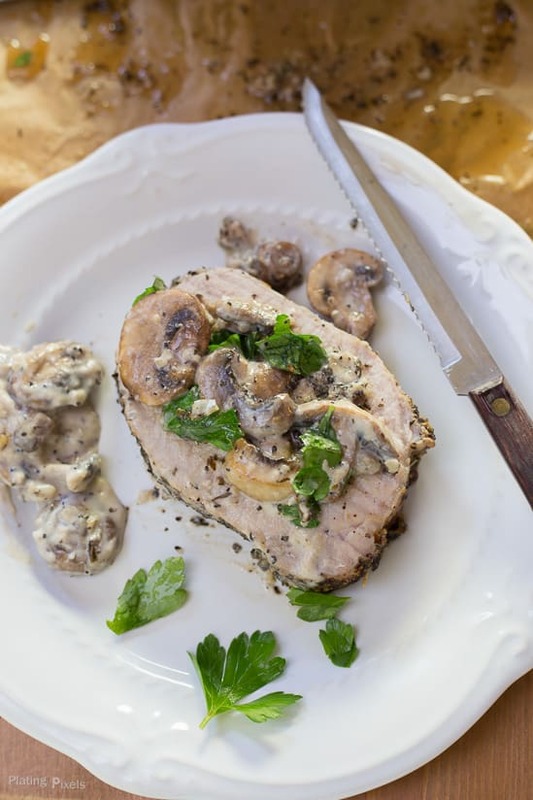 Tender, moist garlic herbed pork loin smothered in a rich homemade creamy mushroom and wine gravy. A truly delicious and impressive roast to serve on special occasions or even weeknights. 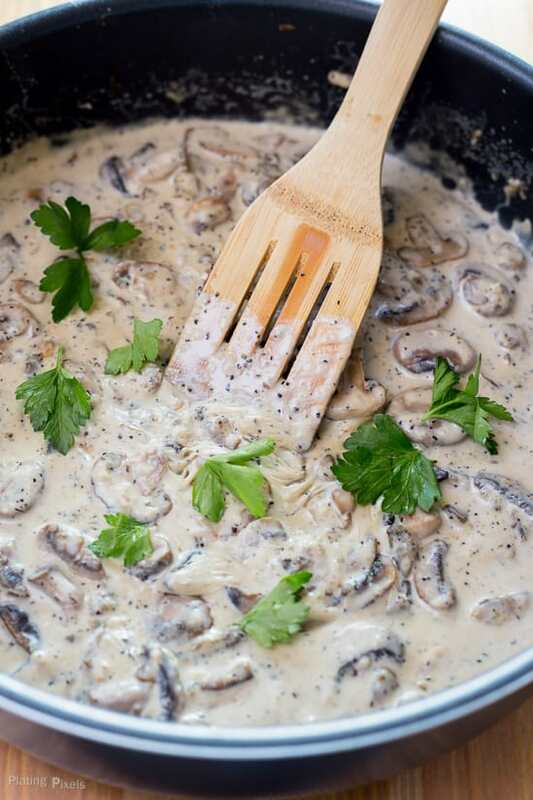 A rich and savory mushroom wine sauce is a decadent pairing that only enhances the flavors of the meat. Pork loin is one of the most tender and lean cuts of pork, and ideal for roasting. This recipe is simple enough for anyone to make, with about 6 ingredients, besides a few pantry staples. Coat the loin with a generous mixture of garlic and dried herbs, and roast at a high heat. While it’s in the oven you can prep the sauce. Garlic and fresh mushrooms, with a white wine reduction, distills a distinctly flavorful base. 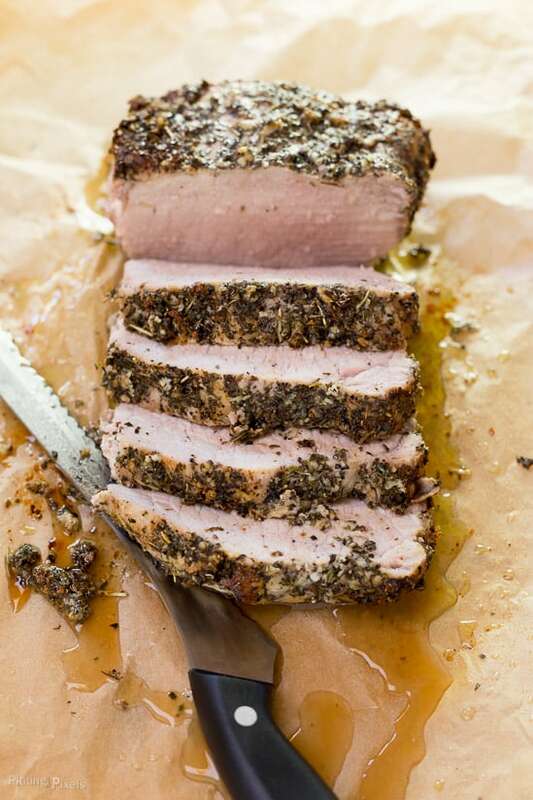 The best way to add a lot of flavor to pork loin roast is to rub it with a mix of fresh or dried herbs, spices, salt and pepper. For this pork loin I rubbed the meat in minced garlic cloves and a blend of Italian herbs. 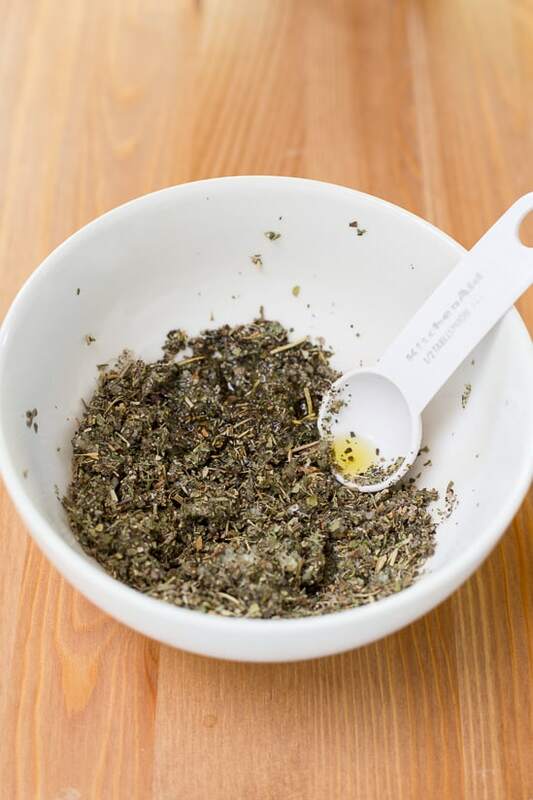 Italian seasoning consists of dried rosemary, oregano, basil and thyme and adds so much flavor to the pork. 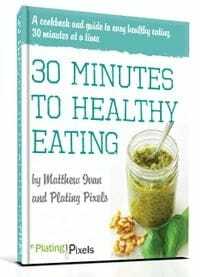 You can choose whatever herbs you prefer, fennel seeds and marjoram would also work really well. What makes a great sauce or gravy is not only the flavor but the consistency. There’s nothing better than a silky smooth sauce to pour over roast meats anfd fluffy mash and this mushroom sauce goes perfectly with the pork loin. The best way to thicken sauces is to add either cornstarch or flour which will thicken the sauce as it’s heated. You only need a small amount because you don’t want to taste the flour you just want enough to create a slightly thick and smooth sauce. Make sure to cook the sauce long enough to burn off the alcohol. You want all of the flavors without it being overpowering and you certainly don’t want a strong alcohol taste in your sauce. Cook with a wine that is fresh and you would drink. If it’s not good enough to drink then flavors will negatively affect the sauce. Half and half creates a rich and creamy sauce that cooks down to a thick gravy-like sauce. Smother liberally over the tender roasted pork loin for a truly special meal. Bring the pork out of the fridge 20-30 minutes before roasting. If you add any cold meat to a hot oven it will tighten and toughen the meat. Bake 45–60 minutes at to 425º F., or about 20 minutes per pound. Cook to an internal temperature of 145º F. for medium rare or 160º F. for medium. Just as importantly let the meat rest after roasting for at least 10 minutes this helps keep the meat tender and juicy. If you cut the meat too soon all the flavor and juices will run out of it. Cook the pork for 20 minutes per pound it should reach an internal temperature of 145º F for medium rare or 160º F for medium. It cooks slightly as it sets, so I recommend 145º. 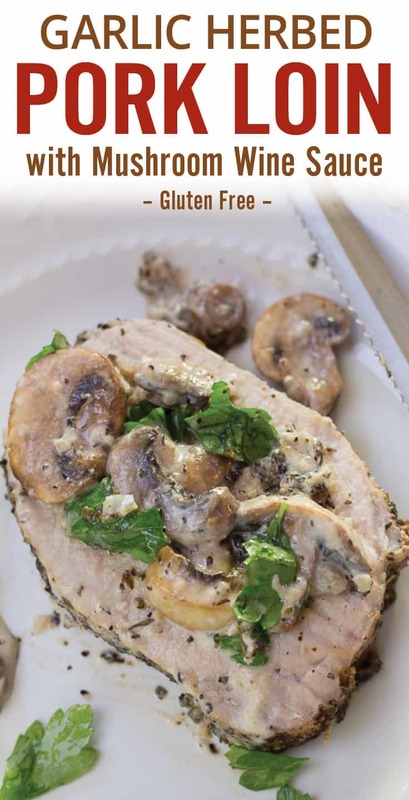 Flavor profiles: Savory pork loin paired with a rich mushroom wine-reduced sauce. Texture: Tender, moist pork with a slightly crunchy garlic herb coating. Topped with a thick, creamy sauce. Dietary Options/Substitutions: Use gluten-free all-purpose flour for GF. 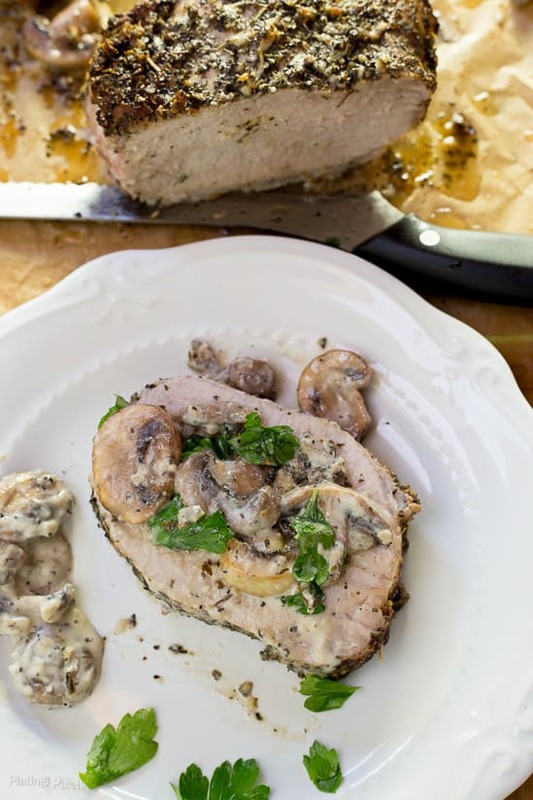 Tender and moist garlic herbed pork loin; smothered in a rich mushroom wine sauce gravy. Preheat oven to 425º F. In a small bowl, mix together Italian seasoning, salt, pepper, garlic and olive oil. Place pork loin in a foil or parchment lined baking dish. Evenly rub mixed seasoning blend all over pork, including bottom. Bake 45–60 minutes (about 20 minutes per pound), to reach an internal temperature of 145º F. (medium rare) - 160º F. (medium). Remove and allow to rest 5–10 minutes (it cooks slightly as it sets, so I recommend 145º). Cut into slices before serving. Close to when pork loin is finished cooking: Heat olive oil in a large pan or skillet to medium-high heat. Add garlic and cook 2 minutes until light golden color. Add mushrooms, salt and pepper; sauté 5–7 minutes to desired doneness. Stir in white wine and cook 3–4 minutes to evaporate most of liquid. Reduce heat to medium, add half and half and cornstarch. Cook 5 minutes, stirring often, to thicken up sauce. Spoon sauce over roasted pork loin slices and garnish with optional parsley. I made this last night for company. Holy cow! It was delicious. The only thing I did differently was substitute fat free almond milk for the half and half, and it was still rich. Thank you for the recipe! I will be making this again soon. Hi Laurie. Glad to hear that and I like the tip to lighten it up. Thanks so much for the feedback, it means a lot! Would it be possible to substite the wine with a broth of some sort? Thanks! Hi Erika. You could sub it with a stock or broth but dry wine adds a unique flavor. If you don’t mind cooking with alcohol, I love using dry vermouth as it stores for months or longer, even after opening. Is this recipe using pork loin or tenderloin? Hi Joanne. Tenderloin is the long narrow fillet. This recipe uses loin which is more like a round roast. This looks so delicious – both the roast and the sauce. I just might make this for Christmas. A nice pairing indeed! I’m turkeyed out myself and probably will do a ham. 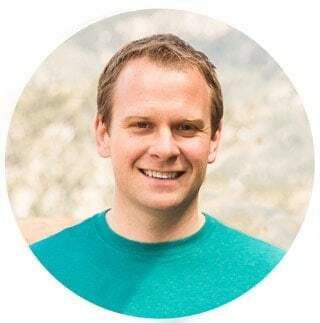 Have a good one Jeff! This pork looks delicious! The crust is perfect! Thanks Melanie! The crust is so flavorful and perfect with with pork. This looks incredible! I love pork loin. This one is definitely going on the “to make” list!! Pork loin is one of my favorite cuts of meat too. Thanks Nicole! This looks absolutely delicious! Definitely saving it…thanks for sharing! Thanks and you’re welcome Shannon! We’ve made garlic herbed pork loin many times and a mushroom wine sauce separately before but I never thought to pair the two together. This dish looks incredible! Making them are both pretty new to me but came out amazing! They do pair perfectly. Thanks Marlynn! This looks so amazing! I couldn’t help but share it on three different platforms. That’s so nice of you! Thank you Roxy!